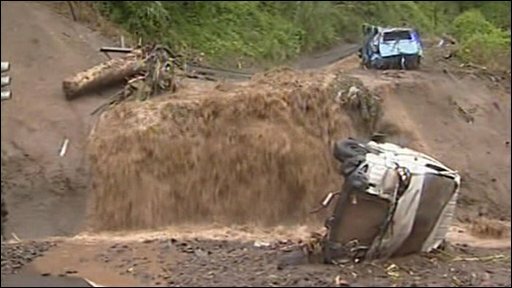 At least 32 people have been killed in floods and mudslides after torrential rains hit the Portuguese island of Madeira, local authorities say. Sixty-eight others were reported to have been taken to hospital for treatment on the Atlantic island, which is popular with foreign tourists. It is not yet clear whether tourists are among the casualties. The local civil protection service was "overwhelmed" by calls for help, a duty officer told Reuters news agency. According to Portuguese media, the storms were the deadliest on Madeira since October 1993, when eight people died. 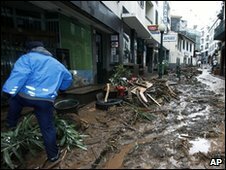 The main city, Funchal, and other towns and villages on the south coast are thought to have been worst affected after strong winds and heavy rain early on Saturday caused flooding and landslides. Television pictures showed muddy torrents coursing down narrow channels and spilling over the sides, roads awash with water and streets littered with debris. The island's airport was closed and Funchal mayor Miguel Albuquerque advised people to stay at home. Trees have been brought down and rocks carried away by the floodwaters, blocking roads and hampering emergency services. Some bridges and roads have been washed away and cars were swept away. One woman was killed when the roof of her house caved in. Some residents had to be evacuated. Power and telephone services were disrupted in some places. British holidaymaker Cathy Sayers told the BBC Funchal was like a ghost town. She said the infrastructure had been "decimated" by the water. "The drains just cannot cope with the water that's coming down from the mountains - they are just overfilled with sludge." There had not really been any warning that it would be quite so bad, she said. "I think everyone is extremely shocked that this has happened at this time of year," she said. Local media say the authorities' main concern now is for residents of Nuns valley - an isolated mountainous region that rescue workers have been unable to reach. Portuguese Prime Minister Jose Socrates said he was "absolutely saddened and shocked with the images, with the consequences of this calamity", Reuters reported. He is expected to go to Madeira shortly to inspect the worst-affected areas and co-ordinate aid. "The problem requires a response on the national level," Interior Minister Rui Pereira was quoted as saying. He said Lisbon was considering declaring a state of emergency in the region. Regional government leader Alberto Joao Jardim said the authorities were making temporary shelters available for hundreds of people left homeless. The BBC Weather Centre says the severe weather was due to a low pressure system, and that while Madeira can expect further rain with heavy downpours on Sunday, there is no danger of a repeat of the flash floods.